so about the support of the duet for other displays than the PanelDue. 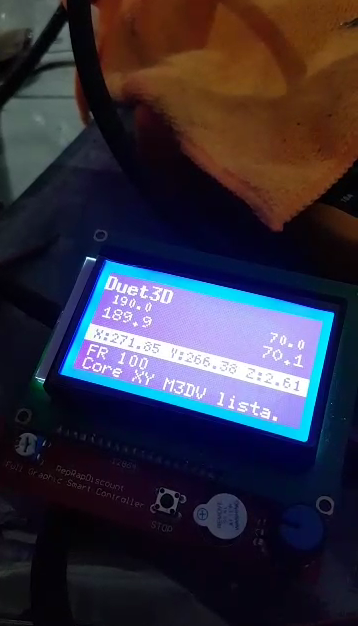 The Makers of the CraneQuad (M3D) state in this video (11:20 and ongoing), that the duet now supports the LCD12864, is that true? the duet maestro yes. the duet wifi/ethernet is missing crucial hardware. The connector was for a 20x4 text display that uses 3.3V signal levels. But nobody makes those as complete units, and the 2-line format can't display very much information. So we never added the 20x4 support in firmware. It's possible that a 3.3V compatible 12864 display would work from the SPI daughter board connector without level shifters, although the datasheet implies that the SPI clock signal needs to be gated externally with CS. It's not hard to find 3.3V-compatible 12864 displays, but all the cheap integrated display+encoder combinations seem to be 5V only. Old discussion, without firmware support it is useless to think about how or which display can be connected. There are some options but they are made by users and not all well documented. The firmware support could be enabled fairly easily if the hardware support was there. It would probably be necessary to reduce the maximum number of stepper drivers and axes supported when the display is enabled, to free up memory. @cata is there some documentation for how to get arduino+12864 running on the paneldue port? M3D did write a significant portion of the 12864 display code in RRF. @oliof basic info in pieces in this forum and little comments in spanish grups.